Welcome to my world! : My dream car! Gosh!! I'm totally in love with Honda Civic type R, when I saw this car, I just had to have it!! but urghh I'm still studying and yea obviously can't afford to buy this perfect car at this moment. haha. Honda is always a brand that I respected very much. It's so comfortable and is smooth on the highways. Plus, Civic type R is a perfect car for me. It looks gorgeous and so stylish that you feel good just being seen it. LOL! ok enough of dreaming Shima. hehe! I can't blame you, my friend. 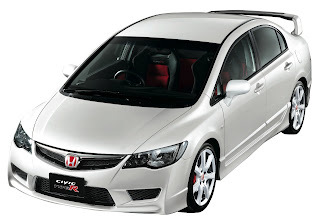 The Honda Civic type R is the highest performing version of the Honda Civic made by Honda Motor Company of Japan. Actually, they went on sale last March 30, 2007. “~dreaming is not enough. if we don’t commit to hitting the goal, no list in the world will get us there :)”— It’s quite true, Monster Girl. A dream will always be a dream, unless we turn it to reality. There's nothing wrong with dreaming, just learn how to drive it and before you knew it, you're actually driving IT. You got a good point there, Basil. You could never make your dreams come true if you don't act on it.It's not enough that you know how to dream, you should learn the right way of hitting it. Just like driving, you would never start the engine without turning the ignition key.